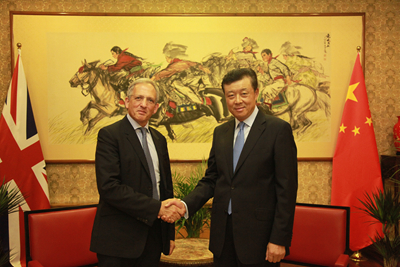 On 2 August, Ambassador Liu Xiaoming met with Sir Jon Cunliffe, Deputy Governor of Bank of England, at the Embassy. The two sides exchanged views on 1+6 Round Table Dialogue in Beijing, G20 Hangzhou Summit and China-UK financial cooperation. Sir Jon Cunliffe said, the successful 1+6 Round Table Dialogue between Premier of China Li Keqiang and heads of IMF and other 5 international organizations not long ago generated profound insights on promoting economic growth and improving global economic governance. The G20 Finance Ministers and Central Bank Governors Meeting in Chengdu held in-depth discussions over important topics including macroeconomic policy coordination, innovation-driven growth, and prudent financial regulation, and reached consensus on many issues. China's G20 presidency provided important leadership. The UK will continue to attach great importance to promoting UK-China financial cooperation, give full play to its strength and role as an offshore RMB centre, and continue to support the internationalisation of RMB. Ambassador Liu said the Chinese economy maintained a steady growth momentum and served as an "anchor" for global economy. China is confident in handling its own affairs well and bringing greater and fresh contributions to world development. The UK is going through a period of adjustment after its referendum to leave the EU, and China-UK relations are at an important historical juncture. The two sides should bear in mind the fundamental interests of the peoples of both countries and make joint efforts to sustain the hard-won momentum of China-UK relations. China is willing to strengthen cooperation with the UK in various fields to achieve win-win results. The Bank of England has an important role to play in deepening China-UK financial cooperation. China will take the important opportunity of G20 presidency and make concerted efforts with the UK and all stakeholders to promote robust, sustainable and balanced global economic growth.